Seniors – get divorced and save on income taxes? Herman is filing single, and the return would be the same if filed as “married, but filing separately.” His wages were $15,000, plus $10,000 he was required by RMD to take from his IRA or face penalties, plus $25,000 Social Security Benefits. 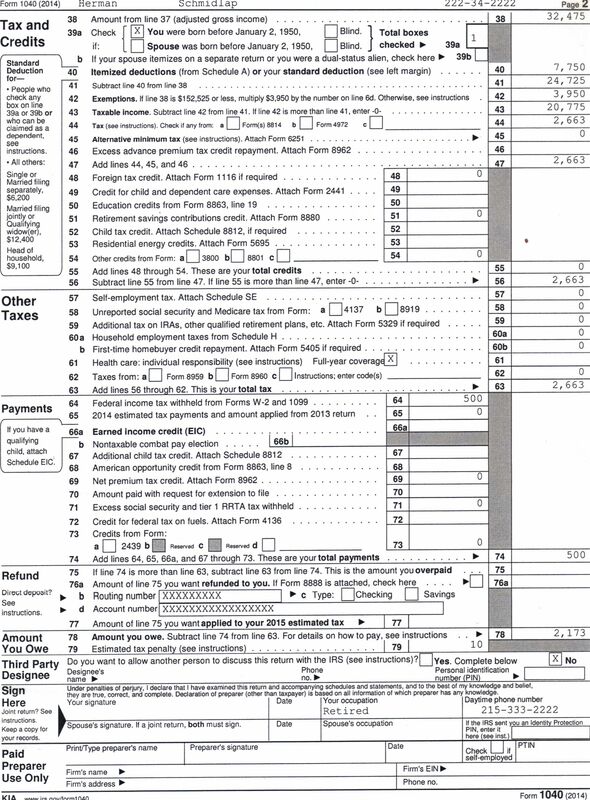 He has a $25,000 basis (=income plus 1/2 Social Security benefits) before taxing additional Social Security benefits. 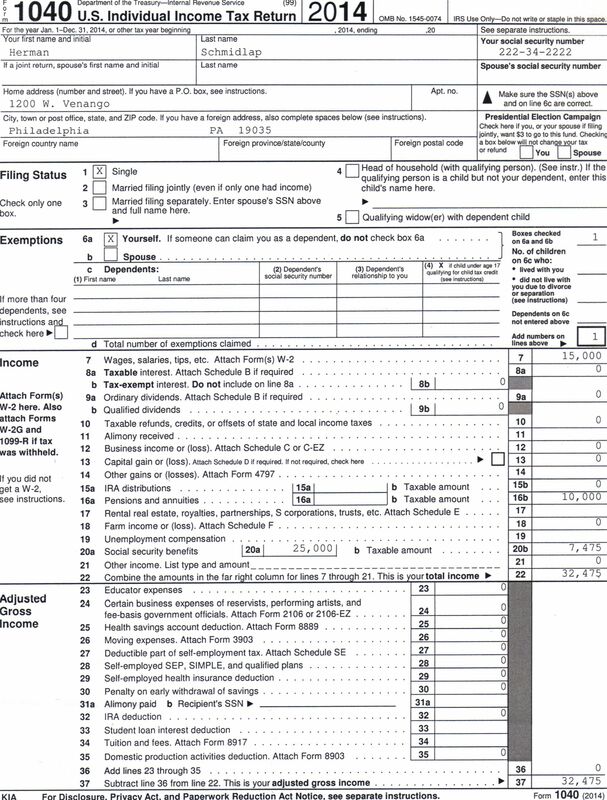 He has one exemption, $500 into tax withholding, and his taxes due total $2,173. If girlfriend Sylvia filed a similar return and also claimed she was single, she would owe the same amount. Together their tax bill would be $4,346. Herman and Sylvia had the same combined wages, RMD, withholding and Social Security benefits. 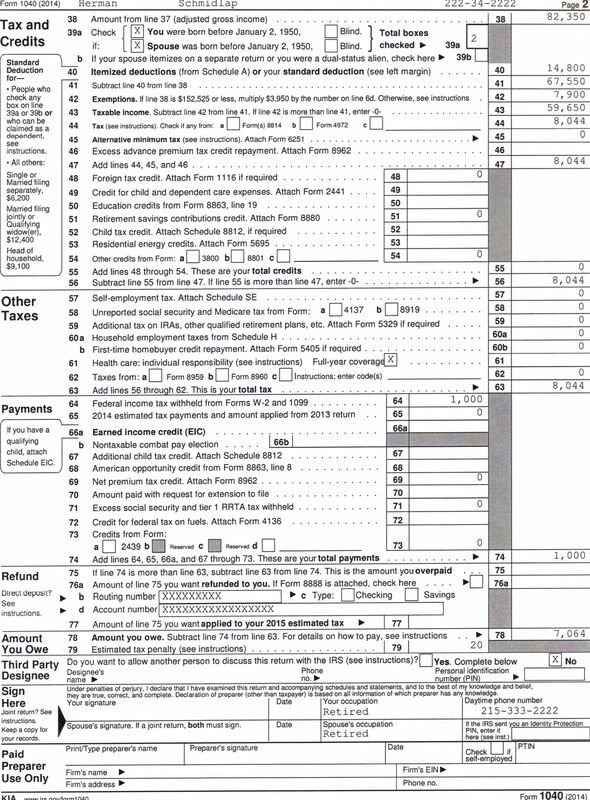 However, the bottom line on the 1040 is not the same as the combination of two separate returns. Comparing the two return methods shows the married couple pays 62% more than if they were single, filing separately. The major reason for this unfair outcome? Single filers get a $25,000 credit towards earnings before additional Social Security is taxed, and married joint filers get only $32,000 combined. By the way, this number has not changed since Greenspan and company’s commission initiated cuts in the Social Security program in 1983. At that time $32,000 was a lot of money, but it was never increased the past 32 years, despite inflation, and the disparity between the $25,000 single and $32,000 married was never addressed by a Congress not too concerned with seniors, unless that includes “talking” concern during election campaigns. A note to your Congressperson or Senator might help start the ball rolling in a fair direction for how we tax the retired. It would be sad to split for financial reasons…and embarrassing! I expect some folks do it quietly and lie about it to their friends and family. Seems like a simple law could fix the discrepancy. I’ll sign the petition!! I’d love to see you analyze this situation under today’s tax laws, any chance you will be doing that soon? Nothing has changed. New 2018 tax laws kept in the old $32k, and while everyone else got a tax cut – seniors, who tend to have high med expenses, in many cases paid more – like me – because of no personal exemption. AARP is asleep as usual, and nobody wants to change law because it would mean seniors would pay less income tax (now $40 billion a year on benefits), and might live longer and happier. Elites consider old folks drones – cause they can’t work due to age, health, etc.